Late on Friday, Microsoft and Motorola made some really interesting filings in the FRAND enforcement case in Seattle (which has already resulted in a temporary restraining order against Motorola). The parties filed reply briefs defending their respective motions for partial summary judgment (Microsoft asks the court to find Motorola in breach of its FRAND-related contractual obligations while Motorola claims Microsoft repudiated its FRAND rights). In addition, Motorola filed, in a publicly accessible form, its proposed redacted version of a transcript of a telephone conference that took place on February 13, 2012 between Judge James L. Robart and the parties' lawyers. That transcript was not previously available to the public, at least not on the Internet. Just to clarify, RAND and FRAND are synonyms. 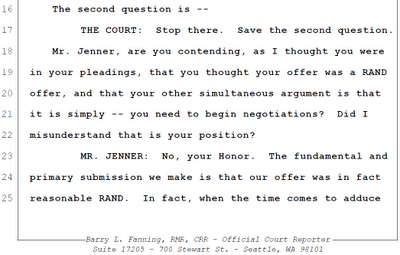 RAND stands for "reasonable and non-discriminatory", so "reasonable RAND" is duplicative. For more information on those charts, please check out this recent post. In the following, I'll summarize the key points made in the reply briefs mentioned at the beginning of this post. Based on Motorola's motion for partial summary judgment, it was quite clear that Motorola never seriously expected that motion to succeed -- it brought it primarily in order to have additional space for its arguments in parallel to the process concerning Microsoft's motion. Yesterday's brief does nothing to counter that impression. Large parts of the brief make the argument that Microsoft should have engaged in further negotiations after Motorola's initial demand instead of going to court -- but Judge Robart already said in late February that "genuine disagreement" between the parties over these terms can arise anytime, and when it does, "it appears to the court that the only recourse for the parties is to file a lawsuit in the appropriate court of law". Even more tellingly, the final part of Motorola's brief is devoted to arguments that relate to other decisions, which the court may take after denying a summary finding of repudiation. 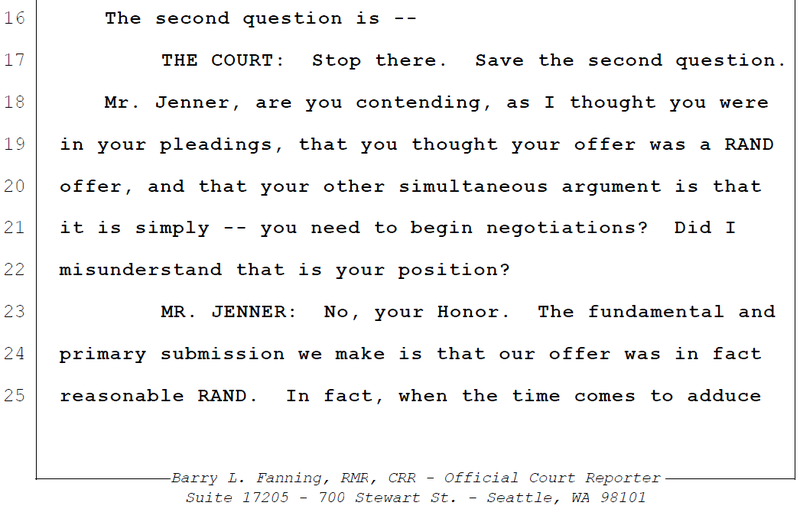 In particular, Motorola states that it understands the court "the Court intends to determine all material RAND license terms for the parties if they are not able to do so themselves", and argues that it shouldn't do so. One of Motorola's arguments is that its FRAND commitments should be held unenforceable because "[c]ommercial agreements to negotiate upon terms and conditions to be decided ('agreements to agree') are generally held to be unenforceable". This has nothing to do with a motion to hold Microsoft to have repudiated its FRAND rights, other than representing an issue that would be addressed subsequently to the failure of this motion. Litigants usually try to exude optimism rather than bring premature pleadings that presuppose the defeat of a motion the court has yet to rule on. In all fairness, Motorola is in a difficult position in that FRAND enforcement case. The court has already decided (after Motorola admitted) that Motorola has FRAND-related contractual obligations and that Microsoft is a third-party beneficiary of those contracts. It has also been clarified in this action that a "blatantly unreasonable" royalty demand constitutes a breach of such an agreement. And the court barred Motorola from enforcing, for the time being, an injunction it may (or may not) win in Mannheim on May 2. For Microsoft to be granted its motion for partial summary judgment of breach of contract by Motorola, it's key to convince the judge that this finding is possible at or shortly after the motion hearing scheduled for May 7, as a matter of law, without requiring a jury verdict. Time is of the essence since Motorola is pursuing injunctive relief in Germany and at the ITC. Microsoft's brief recalls that "Motorola's demand would result in annual payments of $4 billion, amounting to more than 20% of Microsoft’s annual profits". It notes that Motorola later denied that products implementing two standards (H.264 and IEEE 802.11) would be subject to a combined royalty of 4.5% (twice 2.25%) but didn't clarify this in its initial demand letters. A large part of the brief focuses on Microsoft's argument that "Motorola needed [but in Microsoft's opinion failed] to present evidence from which a finder of fact could conclude its demands were reasonable". This means that any jury that is not biased or intoxicated would agree with Microsoft because Motorola's demands were so far from reasonable that only one outcome -- breach of contract -- is possible. Motorola's opposition brief clearly placed the emphasis on arguments that there are factual disputes, i.e., arguments for the involvement of a jury. Microsoft's reply brief addresses those arguments. For example, Microsoft points out that Motorola's license agreements concerning wireless standards aren't comparable to the use of H.264 or IEEE 802.11 by Windows or the Xbox, given that "cellular standards are critical: a cell phone that failed to comply with cellular standards would be unusable". Also, Microsoft interprets the existing license agreements adduced by Motorola as confirming Microsoft's position, but since any detail about those agreements is redacted, I don't know what the terms of those agreements are. Not even the names of the parties are disclosed. In a footnote, Microsoft notes that its "pricing of an add-on to allow older Xbox models to connect to WiFi networks is irrelevant" because the manufacturing and sale of such an add-on are very different from the integration of an 802.11 chip into current Xbox models. In connection with the chip price, Microsoft also rejects Motorola's comparison of the price of an 802.11 chip to that of a blank recording medium, stressing that "[t]he 802.11 chipset Microsoft purchases for inclusion in the Xbox 360 is not a blank medium upon which the 802.11 standard will be written--it already contains 802.11 technology". With reference to Motorola's argument that Microsoft didn't necessarily have to pay the demanded royalty rate in cash since it could also have granted certain rights back, Microsoft basically argues that if a demand is excessive, it's excessive no matter in which currency or combination of currencies it must be paid. "Owners of patents or patent applications determined by MPEG LA’s patent experts to be essential to the AVC [H.264] Standard and who have cooperated in the above terms include Columbia University, Electronics and Telecommunications Research Institute of Korea (ETRI), France Télécom, Fujitsu, LG Electronics, Matsushita, Mitsubishi, Microsoft, Motorola, Nokia, Philips, Robert Bosch GmbH, Samsung, Sharp, Sony, Toshiba, and Victor Company of Japan (JVC)." "Motorola's current demand for $4 billion in annual royalties is orders of magnitude higher than the pool rates it endorsed in 2003 in representations to Microsoft and the public. Motorola's criticism that pool rates cannot be compared 'to a negotiated one-on-one license' only serves to contrast SSO [standard-setting organizations'] goals (widespread adoption of socially-beneficial standards) with Motorola's goal of patent hold-up, using its standard-essential patents as bullets in the gun pointed at prospective licensees."